HCM City (VNA) – More than 200 domestic and international artists will perform at the 11th Arts Festival Autumn Melodies slated for August 19-27 in Ho Chi Minh City. 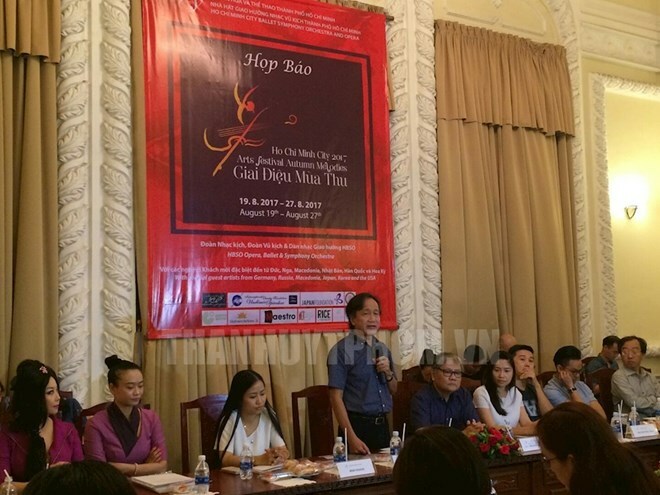 Tran Vuong Thach, Director of the Ho Chi Minh City Ballet, Symphony, Orchestra and Opera, said at a press conference on August 2 that the nine-day festival will feature 12 programmes, covering various art genres like opera, chamber music, symphony and temporary dance. “The Bat,” (Die Fledermaus) an operetta composed by Johann Strauss will be introduced to Vietnamese audience for the first time and open this year’s festival. Of note, there will be a classical guitar concert performed by Saigon Guitar Quartet and international artists. The biennial event will be closed with masterpieces by well-known composers like Brahms, Smetana and Tchaikovsky.